DIGITAL SATELLITE, TERRESTRIAL or CABLE INPUT TUNERS. UDP/RTP/RTSP INPUTS for feeding in local programs/services. MPEG2 to H264, H264 to MPEG2, HD to HD, HD to SD, or SD to SD transcode. VIDEO TRANSCODING Input / Output: MPEG2 or H264 | Any input codec to any output codec or passthrough. Possible transcoding: HD -> HD (4 CH), HD -> SD (4CH), or SD to SD (8CH). Resolutions: 1080p, 1080i, 720p, 576i, 480i (equal resolution or scale down transcoding). DECRYPT BISS. Modes BISS-1 and BISS-E. Max. 8 programs. 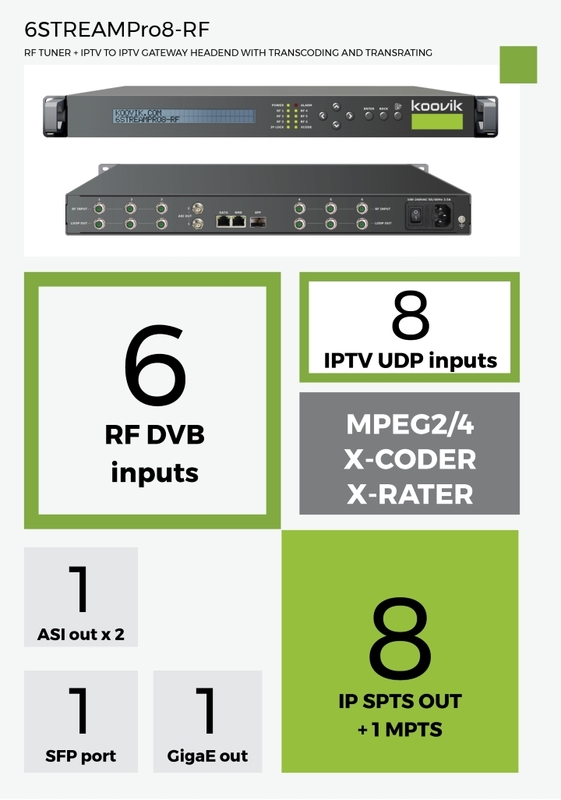 Audio TRANSCODING Input / Output: MPEG1 Layer 2, LC-AAC or AC3* | Any input codec to any output codec or passthrough. IP 8 x SPTS + 1 x MPTS (Re-Muxer) over UDP or RTP/RTSP. Unicast or Multicast. ASI 1 x ASI ( 2 mirrored ASI outputs ). Copy of one of the IP out streams (SPTS or MPTS). BNC female. network 1GigaE 1000Base-T Ethernet Interface or SFP port (user selectable). SET-UP Local: Front panel LCD display and keyboard. Network Management Setup - NMS: Embedded web server (English). included 1 x mains cable, 1 x ground cable, 6 x RF loop cable, 2 x BNC male to BNC male.